Here it is, already 2019! Thoughts of warm weather and delicious Maine wild blueberries can help us through these long cold days of winter. With that warm weather, comes the blueberry harvest and the ever popular 44th Annual Machias Wild Blueberry Festival! This year’s dates are August 16-18th. New this year…online application and payment option! We will continue to offer three, two, and one-day lots, and have dedicated vendor lot attendants! These attendants are there to answer any questions you may have, hopefully making quick work of any troubleshooting Lunch delivery will remain an option for all our vendors on Saturday and Sunday, and we will have the Swamp Yankee Barbecue for your dining pleasure on Friday. Once again, all vendors in our lots will be provided with a sign designating that you are an official registered vendor of Centre Street Congregational Church, as well as a lot number to attach to your pop-up tent. Wi-Fi access will be available to all our vendors, and you will be provided with an access password when you arrive. We will have additional overnight security this year with a dedicated security person for our lots as well as the church. .
We are now offering electricity for up to 12 lots on the Church Commons for the three and two- day lots. You will need to bring your own 100 foot, heavy-duty, 12 gauge, extension cord. Generators are not permitted. The lots for which we can provide electricity, will be designated as such, on the vendor maps. The Church Commons 3-Day Lot will be the three-day lot for vendors who wish to participate on Friday, Saturday, and Sunday. The Church Commons 2-Day Lot will be for two-day vendors who wish to participate on Saturday and Sunday. The Bangor Savings Bank lot will be designated as a two-day lot, for use on Saturday and Sunday. The County lot will be the one-day lot, for Saturday only. There will be no vendors in the County lot on Sunday. Booth spaces will be assigned by the end of May (I hope it’s sooner, but I’m giving myself some wiggle room), on a first-come, first-serve basis. We will make every effort to accommodate your space request. When we receive your application and payment, you will be assigned a space. We will charge an additional $25.00 (total) to the above fees for corner lots. An additional $50.00 will be charged for electricity. We will still provide the vendor shuttle service, as well as daytime and overnight parking at Machias Memorial High School. This parking lot can accommodate recreational vehicles, but there is no electricity or water. The dedicated shuttle service will run on Saturday and Sunday. If you opt for the three-day lot, Court Street and Centre Street will be open on Friday, so the shuttle service will not be needed on this day. You will receive a “vendor tag” to place in your car during the festival. Parking will NOT be allowed on Court Street or Centre Street on Saturday and Sunday NOR will it be allowed at any time on any part of the Church Commons/Green Space, including overnight. Your vehicle will be at risk for being towed at your own expense. Please help us cooperate with our local police department. Three-day vendors on the Church Commons Lot: Thursday evening between 5:00 pm and 7:00 pm or from 6:00 am to 8:00 am on Friday morning. Two-day vendors on the Church Commons Lot: Friday evening between 5:00 pm and 7:00 pm, and between 5:00 am to 7:00 am on Saturday morning. Cars must be off of both Court and Center Street by 7:15 am Saturday. Two-day vendors at the Bangor Savings Bank Lot: Between 5:00 am and 7:00 am on Saturday morning. Cars must be off of both Court and Center Streets by 7:15 am. No set-ups on Friday evening will be allowed. If you begin to set up, you will be asked to leave. This lot serves a business (Bangor Saving Bank) and the parking lot is also needed to accommodate parking for the musical comedy on Friday evening. One-day vendors at the County Court House Lot: Between 5:00 am and 7:00 am on Saturday morning. Cars must be off of both Court and Center Street by 7:15 am. Take down should be completed by 6:00 pm on Saturday evening. No one will be allowed to set up before these designated times! We expect vendors to stay for the entire day or days for which they have registered. Vendor hours will be 9am-5pm on Friday and Saturday and 9am-3pm on Sunday. Out of courtesy to our festival guests, vendors who choose to leave before the end of these assigned hours may not be invited back another year. We will welcome you with coffee and blueberry muffins as you set up on Saturday morning and your dedicated Vendor-Tenders will be available to answer your questions and help you with any issues that may arise throughout the festival. We look forward to welcoming many of you back, and to meeting new participants to this fun, family-friendly, festival! Click here to view the vendor lot maps. What is your preferred lot? Please indicate your 1st, 2nd, and 3rd lot choices. If not completed, we will randomly assign you a spot. Lot numbers are the booth spaces you are interested in relative to the vendor lot maps. Click here to view the vendor lot maps. 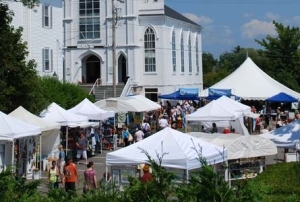 The Machias Wild Blueberry Festival reserves the right to reject a vendor application if the festival organizers determine that the vendor’s products or organizations are inappropriate for the festival or if they conflict with the goals or tenets of Centre Street Congregational Church. Parking is prohibited on Centre Street, Court Street, and on the Church Commons at any time, including overnight, on Saturday and Sunday of the festival (with the exception of during set-up and take-down times). Violators will be towed at their own expense. Security is provided by the Machias Police Department patrolling the area regularly throughout the festival, and our own hired security patrol overnight. The vendor agrees that he or she, together with his or her agents, employees, or volunteers, will cooperate with festival staff, and follow the directions of festival staff throughout the festival. A vendor may be expelled from the festival for being uncooperative, unruly or violent with festival staff or festival goers. In making this vendor application, I hereby and forever discharge and release Centre Street Congregational Church, UCC, from all manner of actions, suits, claims, and/or demands, whatsoever, in law or in equity, for damage or loss arising from the application and/or from my (or my organization’s) participation in the Machias Wild Blueberry Festival. This is a rain or shine event. Vendor application fees are non-refundable. I acknowledge and accept the above stipulations for participating in the Machias Wild Blueberry Festival.